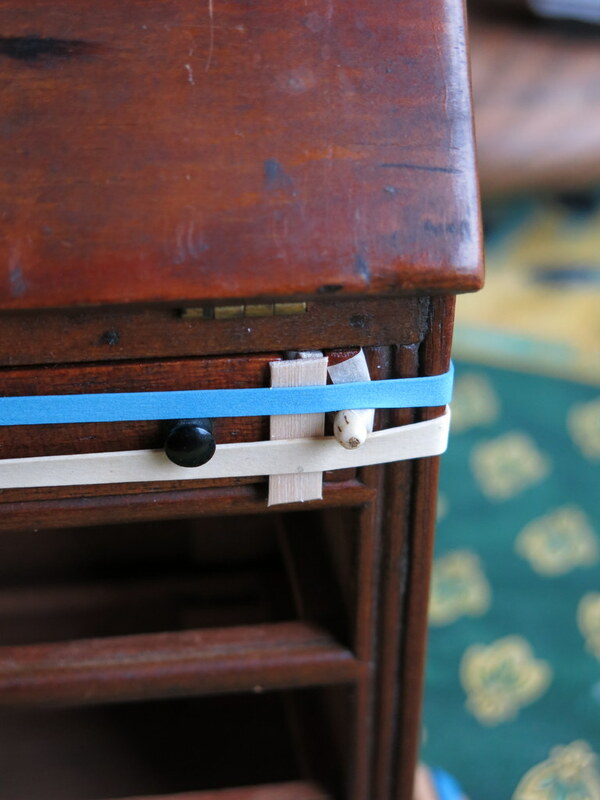 The Quimper Hitty human discovered a very small and lovely old writing desk in an antique store…after repairing the hinges, and making some new mouldings we had to glue them on…we used Titebond wood glue, and applied it with a toothpick. The front moulding is a little bit recessed…so we slid in two pieces of baker’s parchment to protect the sides, and then applied glue to the back and ends of the new piece. We slotted it into place and then put little pieces of scrap wood on top before putting pressure on with elastics. 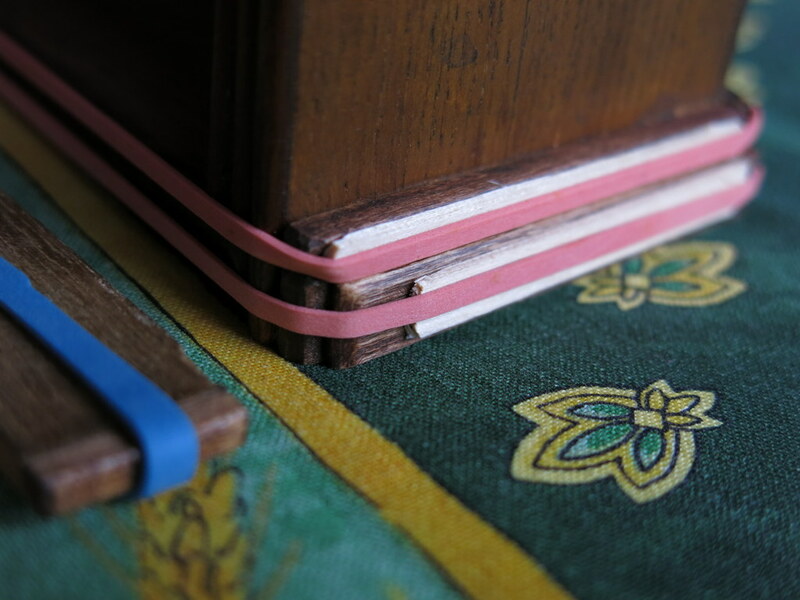 Elastics were also used to clamp the pull-support and the base mouldings while they dried (more waiting, sigh). Finally the glue was dry, and the writing desk was functional again, though there is a temporary pin in the left-hand pull out support. We are still figuring out how to replace that minuscule bone knob! …and the Hittys are now very busy writing to their friends. This is another jaw dropping find…and a jaw dropping repair…what a beautiful writing desk, and leave it to the Quimper’s to bring out a Hitty size inkwell and quill. It was a fortunate find…I am so glad that it came my way, and that I had time, know-how and materials to fix it! The inkwell is a large silver-cored cut glass bead, and the feather was shed by an obliging starling! Absolutely delightful! I do so like to see damaged items brought back to life, no matter what scale they come in. I have learned a great deal by following your writing desk repair theme. Thank you! You are welcome! I had fun working on this project, and I am pretty sure the Hittys are going to make good use of it now that it is in good working order! The desk is beautiful. You did a wonderful job restoring it. Now the girls have no excuse for not writing letters to all their friends. 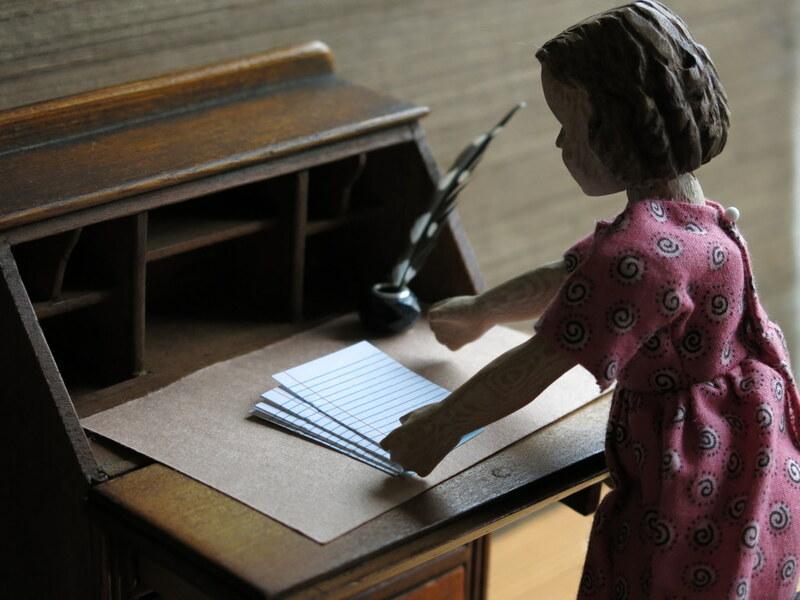 No excuses at all, their friends should be getting letters in short order… but perhaps the desk might also be used for journaling and keeping track of household expenses! All good things for a desk to be used for. Such a lovely piece of Hitty furniture. I love this desk and the repairs you were able to make. 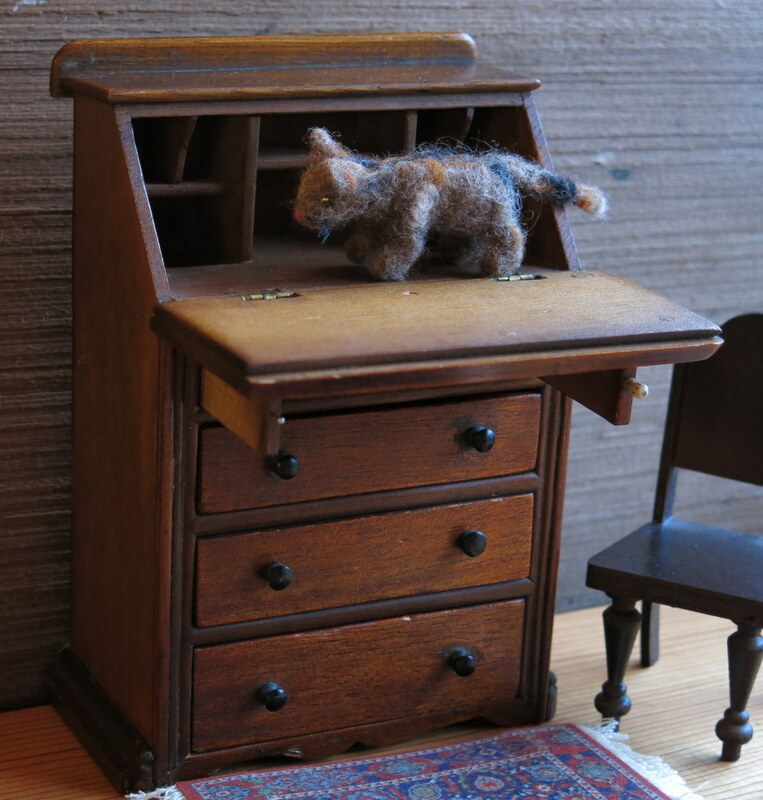 I love this desk too, it is an interesting, useful, photogenic and appropriate piece of furniture for our cupboard, I feel so lucky to have found it! I have a few ideas, some of them involve bone, but I have some bits and pieces at home that I thought I would try. We are experiencing the same cold weather, the Hittys would be shivering but they do have some cold weather gear! WOW…that desk has been repaired to perfection! 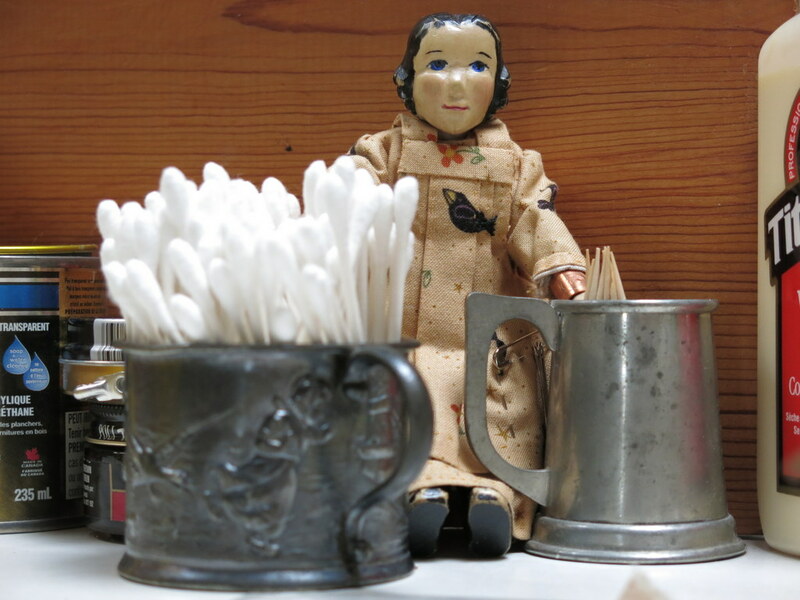 The tiny bone pull might be recreated with clay….wouldn’t be absolutely authentic but could be made to look identical to the existing one. OR with your mad skills you will probably carve the real thing! 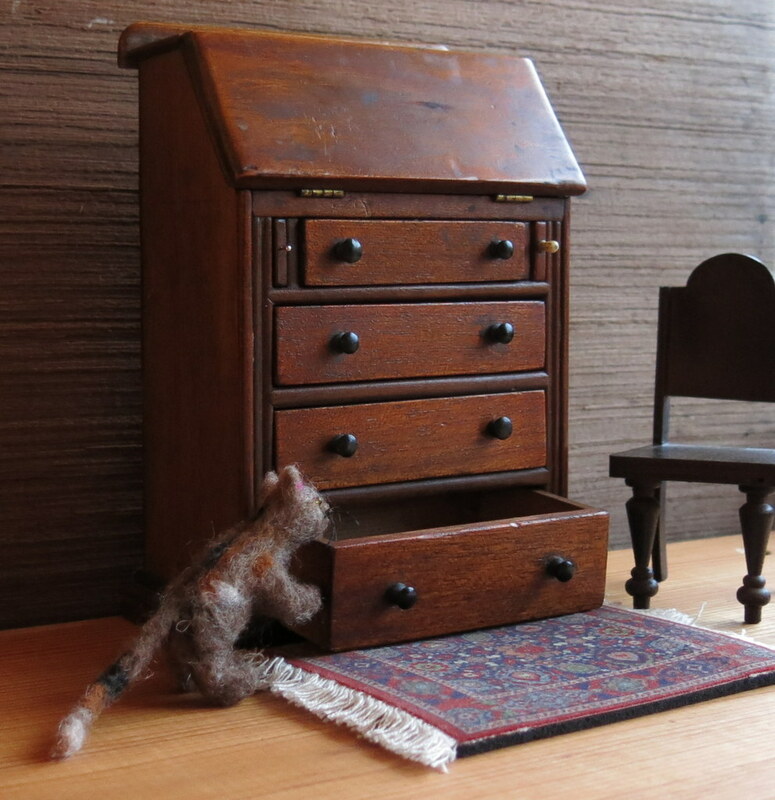 The desk is just lovely, the repairs amazing and now the girls have a treasure to use for their correspondence. Well done Quimper Human! Thank you very much, we are going to enjoy working at the desk, writing to friends and engaging in other pen and paper activities…I keep thinking that I might find a little bone bead that will be perfect as a replacement knob. The pin is working for now, so I am not in a panic to fix that last bit. The desk is just darling. I have never seen anything like it. It is really amazing, so little and perfectly made, and just right for Hitty! Thanks very much – it is the kind of piece of furniture that requires changes in the entire rest of the room!